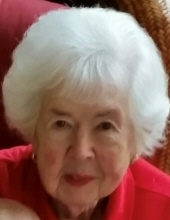 Mary Evelyn LaRue Nida, age 94 years, a resident of Elkins, WV departed this life early Monday morning, January 28, 2019 at the Ruby Memorial Hospital at Morgantown, WV. She had been in declining health although death was unexpected. She was born Thursday, December 18, 1924 at Steubenville, OH a daughter of the late Wilbur and Lora Doris Ward LaRue. On October 31, 1942 she was married to Richard R. Nida, who preceded her in death August 30, 1998. They had celebrated fifty-five years of marriage. Surviving are two sons, Richard Lee Nida and wife Linda of Elkins, Steven Edward Nida and fiancé, Paula Talbott of Elkins; one daughter, Sondra Jean Justice of Bluefield, WV; seven grandchildren, Chuck Higbee and wife Melissa of Princeton, WV, Katie Higbee Balltezer of Wilmington, NC, Richard Nida, Jr. and wife Marsha of Elkins, Shawna Davis and husband John of Elkins, Justin Nida of Summerville, SC, Allison Nida of Murrells Inlet, SC, and C. J. Lewis and wife Amber of Clarksburg; seven great grandchildren, Ashley Nida, Megan Elbon and husband Zach, Madolyn Balltezer, Emily Davis, Tyler Davis, Gunner Lewis, and Jacob Lewis and her beloved fur baby, Lester. Mary was the last surviving member of her immediate family. Preceding her in death was one brother, William LaRue, and one sister, Elaine Cramer. She attended Stonewall Jackson High School at Charleston, WV, and was a homemaker. She was a wonderful mother, grandmother, and great grandmother and was affectionately called “Grandma” by her grandchildren and “G.G.” by her great grandchildren. She was an excellent cook and enjoyed making holiday family meals where she had excellent attention to all the details. She was a former Cub Scout, Brownie, and Girl Scout leader and enjoyed sharing about nature and birds with her children and grandchildren. She was a volunteer at the former Memorial General Hospital, was a member of the Emma Scott Garden Club, the Red Hatters, Beta Sigma Phi, the First Baptist Church and the Women’s Circle of the Church. She enjoyed cross stitch, bowling, was an avid golfer, enjoyed going to Myrtle Beach with her husband to golf, and at the time she moved to Elkins was one of only three left-handed golfers in the area. She was an animal lover. She enjoyed her friendship with the Wednesday night dinner group which included Barbara Harvey and Lorena Sinsel. The family will receive friends at the Lohr & Barb Funeral Home of Elkins from 11 AM to 1 PM, Thursday. Final Rites will be conducted at the funeral home Thursday, January 31, 2019 at 1 PM. The Rev. Linda Roberts and Pastor L. Scott Hamby will officiate and interment will follow at the American Legion’s Little Arlington Cemetery at Cravensdale, WV. The family suggests that expressions of sympathy be in the form of contributions to the Randolph County Humane Society, P. O. Box 785, Elkins, WV 26241. To send flowers or a remembrance gift to the family of Mary Evelyn Nida, please visit our Tribute Store. "Email Address" would like to share the life celebration of Mary Evelyn Nida. Click on the "link" to go to share a favorite memory or leave a condolence message for the family.